Pretty yarn! Oh, don't you just love the inane comments I sometimes leave at absolutely crazy hours of the morning when regular people would be asleep? I had the same thought as you - branching out in alpaca. I decided to try one of those green skeins that you liked, but I think my next one will be in a variegated colorway. 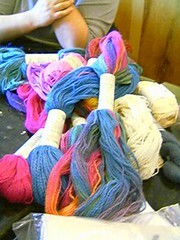 See the KAL (http://knittybranchingout.blogspot.com/) for an example of a beautiful BO in variegated yarn. This page contains a single entry by freecia published on April 9, 2005 5:54 PM. getting updates of bare bones websites was the previous entry in this blog. wifi weather is the next entry in this blog.